Last week The Golf Club at Harbor Shores in Benton Harbor held a season-opening media event to announce a series of enhancements to the Jack Nicklaus-designed course that’s already hosted two PGA Senior Championships (2012, 2014) and with two more on the docket (2016, 2018). McFeeter said Nicklaus understood the concerns about the greens and didn’t oppose the reduction in slope and roll. “To that point, he sent up his golf course architect Chad Goetz and his agronomist Jon Scott and with us came up with a process of amending and enhancing the greens. We put those priorities together and then made the decision to make some improvements.” The work commenced last September and was finished by mid-October. The project resulted in reducing the roll on greens #1, #2, #12, #14, and #16 while on #6 fairway grass replaced rough around the left side of the green to reduce hanging lies and allow for more club options for recovery shots. The slope reduction on parts of the greens ranged from 2-3 inches to 4-6 inches. After playing the front nine last week at Harbor Shores, I came away impressed with how expertly and seamlessly the changes were made. If I had never played there before, I would never have guessed that such renovations were completed only the previous fall. And I definitely noticed a reduction in some of the slopes on the greens. More sensible pin placements could be visualized. 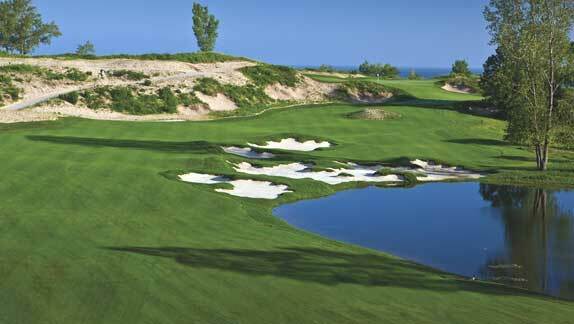 At the same time, Harbor Shores remains a challenging and often frustrating test for everyday golfers and putters. Even with the softening, these large putting surfaces will continue to confound many with an unreliable flat stick. Although not mentioned at the press conference, the important role of green speed will continue to be a major factor in playability and pace of play at Harbor Shores. Given the movement in the greens as well as the usual windy conditions along Lake Michigan, everyday green speeds at Harbor Shores should be adjusted accordingly, as they are at famous links courses overseas, for average golfers. Only competitive golfers and professionals can reasonably manage these greens when the stimpmeter measures above 10. But good luck trying to sell that! It should be noted that the 10th green at Harbor Shores, famous or infamous for its treacherous four-tier design, remains untouched. McFeeter explained the green has ample pin placements and if golfers’ approach shots find the proper tier it’s playable and puttable. Besides, when Nicklaus holed a 100-foot roller-coaster putt during the grand opening, that green became an overnight social media sensation. Sometimes showbiz and entertainment have the last word. All in all, the smart folks at Harbor Shores are to be commended for making these changes even though in many ways they are, to paraphrase Haigh, more of a “tweaking” than anything. Still, they are telling and reflective of a commitment for constant improvement. That’s been the mantra of the Masters and that’s why Augusta National has witnessed numerous changes to its storied landscape over the years. From what I hear, that’s turned out pretty well. In addition to the course improvements, other news last week at Harbor Shores included the PGA of America donating $75,000 to the Benton Harbor Promise Foundation. Mirrored in part after the Kalamazoo Promise, which guarantees free college tuition to graduates of Kalamazoo Public Schools, the Benton Harbor program not only ensures community college and technical school scholarships but also offers internships and mentoring opportunities for area at-risk high school students. TOPICS: Courses and Travel, Golf, Personalities	Tags: Benton Harbor, Benton Harbor Promise Foundation, Bob McFeeter, Harbor Shores, Jack Nicklaus, Kerry Haigh, Michigan golf, Nicklaus Design, PGA of America, Ryan Ogle, Senior PGA Championship, SW Michigan golf, Terry Moore, The Golf Club at Harbor Shores, Whirlpool Corp.